| Don't know what was happening, but strangely it fascinated me. "This was once all Cherokee land. It was considered sacred ground, and trespassers would be killed on sight." At the very least, you can say that "Beacon point" is a weird and rather strange movie. After seeing it you're wondering what in God's name it was about anyway. I started watching it without any clue what it would be about. And by the time the end credits rolled over the screen, I still didn't have a clue. In the first 15 minutes there are also some events which in hindsight had nothing to do with the whole story. 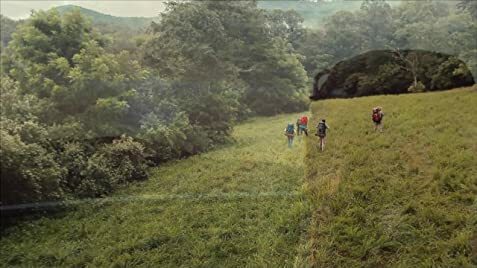 It starts with a Predator-like scene where two hunters, who look like they have just returned from a Vietnam tour, are chased by something unknown in the forest. Then we see Drake (John Briddell) having an argument with his boss about his criminal past. The result is not too beneficial for Drake. Let's say a fallen antler with sharp ends plays a main role. Then there are some facts that aren't plausible and realistic enough too me. First of all the volunteers who want to follow the Appalachian Trail aren't asking any questions about the person Drake. I suppose they've paid a lot of money for this trip. And yet, nobody is wondering if Drake is the official guide and if he's experienced enough. The participants meekly submit their participation papers and follow the completely unknown and not officially introduced trail master. Even when they find a corpse after a bit of walking, Drake tells them it's just an unfortunate incident and that it's probably the result of a hungry bear the victim ran into while hiking through the forest. So, no problem. And they continue their trip in the assumption that someone else will solve the problem I guess. I know for certain I would turn around, because I wouldn't want to encounter that same hungry bear somewhere. It's also bizarre that in the rest of the film these events aren't mentioned again. As if it never happened. It seems like they've used these events to get a standard playtime for the movie. It seems like random events which have nothing to do with the story line. After these unusual occurrences, we get a lot of walking and puffing. The same as in "A walk in the woods" and "Wild". Not only the course of the story and the cause of all this misery were strange. The most strange thing is that despite the unoriginal, bad dialogues, the ridiculous decisions and the total lack of explanation, I was fascinated by it in a certain way. There's a somewhat tense atmosphere. There are beautiful shots to admire made by a drone I guess. And the acting wasn't so bad after all (just ignore the dialogues). It's only the lack of knowing what happened actually that became an annoyance. Was it the trespassing of an old Indian cemetery that released an ancient curse? Or was it aliens that caused it all? Or did they eat some wrong mushrooms and became delirious? And why didn't they all get sick ? Believe me. You won't get an answer in the end. And the last images causes even more confusion and are a source of new speculations. If you expected a type of "X-files" after seeing the cover, you'll be deeply disappointed. And you can hardly call it horror. There's not one creepy or scary scene in it. The only effect this film had on me was that I'm sure I'll once visit those Appalachian forests. And I'm certain there won't be any martians to haunt me at night. Beacon Point was shot in about 23 days in Georgia and North Carolina.